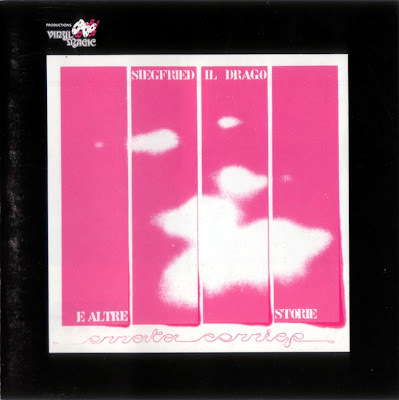 A privately pressed and very rare album, Siegfried, il drago e altre storie was the first and only LP released by this Turin band, that was active from 1974 and that had previously recorded two tapes and some tracks posthumously released on CD in early 90's. The band was initially a trio with no name, then a quartet that only took its name Errata Corrige when newcomer Mike Abate replaced previous guitarist Cardellino. Two demo-tapes, entitled Da mago a musicista and Saturday il cavaliere were released by the early line-ups. The LP is released in 1976, with fantasy-inspired lyrics and dreamy soft-prog atmospheres not unlike Celeste in their first album or Pierrot Lunaire. More complex arrangements and rhythm changes make this an attractive and original sounding record. Band members play a long list of instruments with good musicianship and the result is absolutely positive. The Mappamondo CD includes their first recordings along with more commercially sounding 1977 tracks. After the band split Marco Cimino has played with Arti & Mestieri, Esagono, Venegoni & co. and the Piedmont folk group La Ciapa Rusa, and also appears in the recent Arti & Mestieri reunion CD, Murales. He also was among the founder members of the Turin jazz-inspired label Mu.